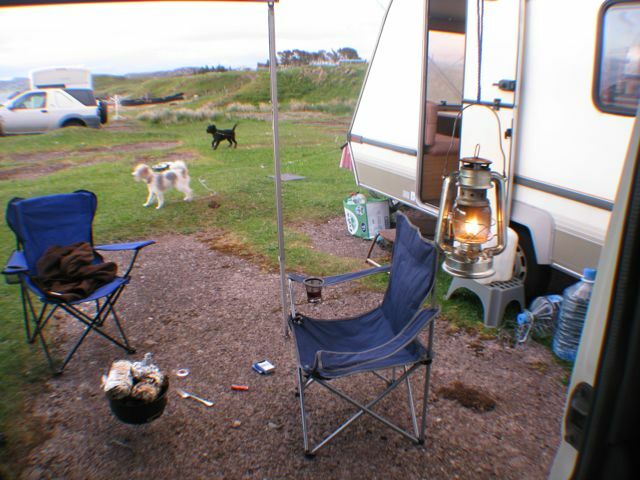 I decided to stay on another day at Loch Ewe, as its a great camping spot, and I'm really just getting started with my sea fishing and want to learn as much as possible before striking out further north. Also this evening we'll eat the big Pollock caught last night. I had noticed on the way to Poolewe that the road snakes around past the upper end of Loch Maree, so a trip down to explore that area was in order after breakfast. Driving down a stony track brought me to the beautiful stony shoreline of the loch, and it was possible to walk along the pebbly shore, past massive boulders, and peering up at tall cliffs. I really enjoyed seeing the loch from this new perspective. On the way back to the car I spotted some deer in the field by the track. They hadn't been there on the way down. 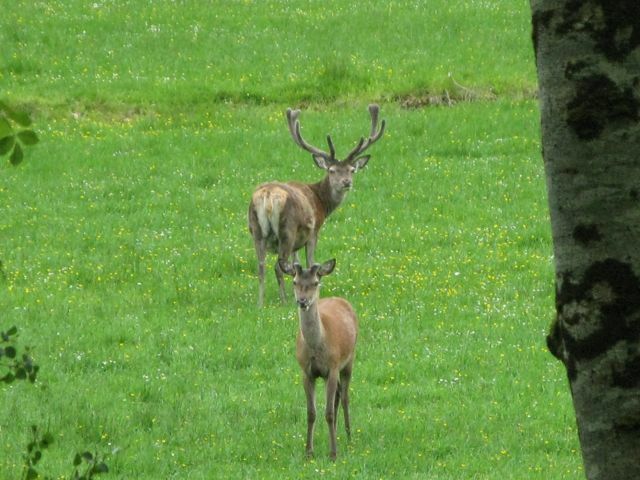 In this photo there are only two, but there must have been about seven deer together in the field at the time looking curiously over at me..
On getting back, it was time to set up camp and prepare for the cooking of the monster. Jo whom I had met at Applecross had arrived at the Firemore camping spot too, and we invited her to join us for the meal and arranged the vans together for shelter. It was time to get the fish ready to go on the already smoking barbecue. We took it down to the river to clean it out in the flowing water, and the gulls would quickly take care of the waste. 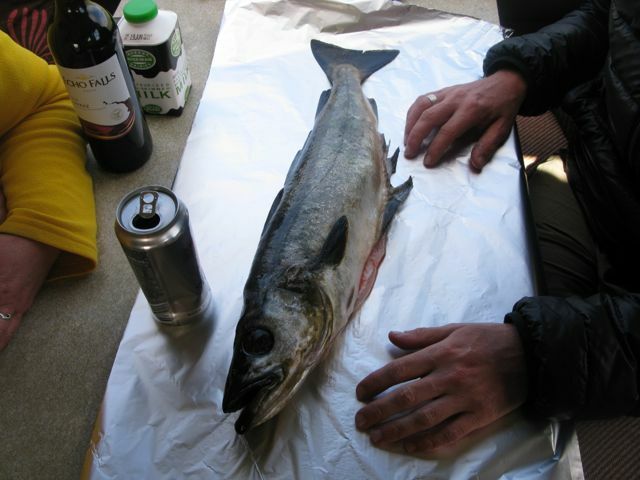 Then back in the caravan, he was laid out and seasoned for cooking in tinfoil..
We all enjoyed the chunky meaty fish with some tomato and veggies also cooked on the barbecue, and some delicious salad. A bottle of rose wine went down well with it all and we had good times and plenty of craic. 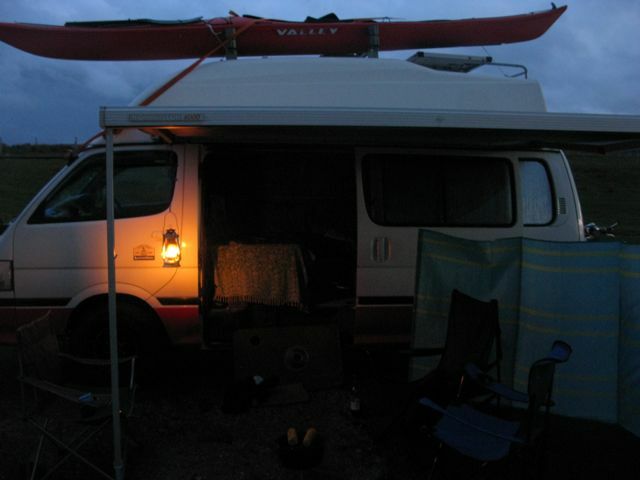 Here's how the camp looked when it eventually got a bit darker after 11pm, with the tilly lamp swinging.